we made it to fort worth today without much to report. There was nothing scheduled today. I met briefly with darcie, mario's brand manager who has been my contest contact for the past month or so. she and i have exchanged about 300 e-mails and a handful of phone calls since I made it to the quarterfinals. so it was nice to meet her. she gave us some of our race tickets and updates the itinerary. oh, and gave me the menu for sunday's tailgate party. i am trying to keep it a big secret that i am not a big nascar fan, so don't tell anyone. but i also suspect that i am going to have a lot of fun. saturday's schedule has us getting to the track at some hour at which i am usually not awake, and we are getting a vip tour of the track, get to check out the pits and watch the race from a suite. my experience with suites and sports events suggests i will enjoy that. after the race, i am going to an event where rachael ray, mario batali and dallas chef tim love are competing in something called asphalt chef. they'll each be paired with a nascar driver and compete in some iron chef-like thing. my understanding is that this is being recorded for the pre-race show on abc on sunday, so check your local listings. after that, pam and i get to go to the swanky speedway club for dinner. sunday, we get to the track early again, and i get to go for a ride in a pace car, then go over to the tailgate party. sounds like i'm not actually cooking, but sitting around getting credit for inventing one of the dishes. the party is supposed to be for sponsors and media. should be interesting. i have seen the menu, and i'll post it on sunday night. i'm not sure if i'm supposed to before the party. 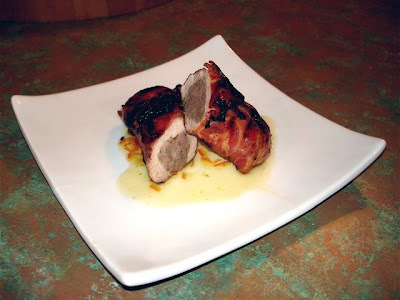 i think I can safely tell you that pig-wrapped, pig-stuffed pig is on there. and i'm pretty humbled by that fact, when looking at the rest. after the tailgate party, we watch the big race from the suites. and we come home monday. a lot of the itinerary is loose, and i'm happy about that. I'm hoping that it give us a chance to do whatever seems fun at the time. oh, the limo ride here was a little bit of an adventure, but it was in a hummer, so that was pretty cool. driver said it costs $250 to fill the tank. gulp. 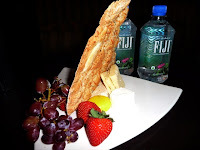 and when we got here, the hotel sent up a cheese plate. that is the picture above. i walked over the central market, which is about a half-mile away. central market is a texas grocery chain with a big reputation, and i was looking forward to seeing it. the one here is kind of new, and it was nice, but nothing mind-altering. i might need to go see one of the original ones. dan will have to tell me where those are. i know he likes the one he has in san antonio. oh and we had lunch at a place called taco diner. it claims to be a mexico city taqueria. very good stuff. we had the steak tacos and some pork sopes. and mango agua fresca. yum. i plan to twitter more from the track tomorrow, and i will post with photos tomorrow night. in the back, there are viva paper towels. i got 30 coupons, each for a free roll. also in back is the uncle ben's pack with 12 boxes/bags of rice. 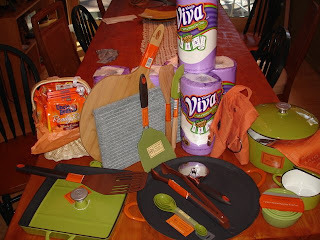 in front of the paper towels, there is a bamboo pizza peel, a slate piastra (a cooking stone you use on the grill), a couple of silicone spatulas and a wooden spoon, an apron, the 4-quart enamel-coated cast iron pot, and a couple of towels. in front of all that, there is the panini pan, with a bronze grill spatula, a pizza pan/griddle, magnetic nesting measuring spoons, bronze tongs, a pizza cutting wheel, a set of measuring/prep bowls and a 2-cup individual pot. not pictured are two pairs of crocs, for which i got coupons to redeem online, and two autographed cookbooks. also not pictured is the trip to texas to meet mario and rachael and hang out at the nascar race. the tailgate party is still the highlight for me, but apparently i will be riding in a pace car, too. more details on the trip to come. you might notice that i have added a twitter feed to the blog. that is how i will update you all from the track this weekend. i will also post blogs and photos each night, but i will try to get immediate updates posted through the twitter. you can add me if you twitter (i feel so, i don't know ... 27), or just check back here for updates. i will send in updates whenever something interesting happens, which i hope/suspect will be often. don't be surprised if you see the tailgate menu and the reo speedwagon setlist on there before its all over. i will probably not be monitoring replies from the track, but i will see them when i get back to the hotel. so don't be offended if i don't @ back at you immediately. on twitter, i am jwscoop. its a long story. ok, it has been six days, and i think i can finally think mostly straight again. by thursday evening, i was sure i had not won. i felt fairly confident that they would call the winner before the air date to give them a heads-up, and when my phone had not rung by about 6 p.m., i was pretty devastated. so i poked around the internet, seeing if i could find anything posted by the other semifinalists suggesting they HAD won, but didn't find anything like that, either. i was exhausted enough that i actually slept pretty well. so friday comes around. 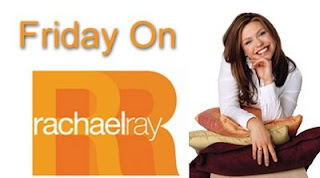 rachael ray's show is on in tampa at 2 p.m. we had learned that it was on at 10 a.m. in orlando and washington dc, in each of which i have plenty of friends that could tip me off. then pam saw that it was on at 9 a.m. in miami, so i refocused my targets. i sent e-mails to everyone i know down there asking if they would be home, or at least near a tv. no one was. apparently, 9 a.m. is a popular time to go to work and/or take kids to school. i had no idea. luckily, john devine had an idea: call bvs. he's retired! so i called bvs and asked if he was near the TV. not only was he, but it was on. luckily, that day's tennis or golf game hadn't started yet. he flipped over to the show and when they got to the announcement, held the phone to the TV. i heard banter, then i heard my name, then i heard rachael, then i just started giggling and heard not much else. i immediately set my facebook status to "jim webster won!" and my e-mail started popping, my home and cell phones started ringing and my facebook wall started filling up. it was amazing. at about 10:20, i was IMing melanie in dc, because it was about to be on there. then at like 10:33, instead of trying to keep up with IMs, i just called her, and listened to it again. i caught little more than i did the first time, because of the giggling and a not-great cell reception. but it was still nice to hear it again. we finally got to work about 11:30, which is a little late on a friday, and my desk was decorated in pink and pig. there were photocopies of pigs all over the desk, pink streamers hanging from the ceiling and a flying pig, which i think is staying. there was a crown with a pig on it, a picture of mario that said "i can't wait to cook with you," and a sign on my monitor that just said, "OINK." before i saw this, i wasn't sure if i would get any work done that day. after i saw that, i was pretty sure, no. when the show finally aired in tampa, i was at my desk. a bunch of people huddled around the TV next to my desk, and scott keeler, one of our photographers, was sitting next to me. i tried to look around a couple of times to see who all was around, but i was finding it impossible to retain information. so i just sat and started watching. then i started to hear the sound go up on multiple TVs, and i saw groups huddled around the newsroom. i was later told this was happening all over the building. so they come back from commercial, and i am actually starting to get nervous. and i know i won. but mario starts talking about the contest and the sponsors and such, then they start talking about "we have a champion." "a CHAMPION?" i think it was at this point i got all ritchie blackmore and may have actually left my body so i could watch the whole thing from a different vantage point. i think i was still ok with it all when mario said, "jim webster of tampa, florida." but it was when he started talking about how they made the dish, how much they liked it and what a good idea it was that i started shaking. it seemed 100% impossible he was talking about me at that point, and i was numb. when it was over, i didn't know what to do next, so i just got up and started shaking hands, hi-fiving and hugging anyone in sight. later, there was cake, which, apparently, you can get a cake with a pig on it from publix with remarkably short notice. i didn't get much done that day, as it turns out. once we gave up pretending that i might accomplish work, we left and met a bunch of friends for dinner at MJ's, which is one of my new favorite places. pam and i went there the night after i had spent the day canvassing for votes in ybor, and had given the waitress some of my cards. she gave one to the chef, who came out and talked to me and seemed very excited about the deal. dinner was great. it was awesome hanging out. i think my favorite part was listening to jeremy analyze the announcement. he and i had discussed the rationalizations supporting me the night before, and he said that mario had pretty much supported everything we said in his announcement. also from jeremy: "it wasn't that mario liked your concept. it wasn't that he liked your execution. mario liked your concept AND your execution." that cracked me up. and when becky said, "does mario know that he was talking about your food the same way we talk about his?" that was cool, too. i got home, and there were about 40 more e-mails and 10 more facebook posts. it was nuts. i feel bad that i haven't responded to each yet. but i hope to. on saturday we went to orlando and i met ronnie at tom's show. we made plans to try to arrange a get-together so i could cook for everyone. i have a million more details i want to mention, but i'm already positive this post is too long for anyone to actually get through. so i'll cut it off now and try to do another soon. i rarely have a problem with speechlessness, but i really have no idea where to start in discussing today. it was an amazing day. i will eventually think about it, and post something, but i wanted to get the video up for anyone who missed. so take a look. so, i haven't seen it yet, but i called my good retired miami friend bvs, and he held the phone up to the tv while they announced the winner ... and it was me! at least it sounded like it was me. i guess i won't know for sure until i watch it at 2.
so, here is what i know, in addition to a year's worth of paper towels and a week's worth of uncle ben's rice (i like my rice), and a bunch of kitchen stuff, now pam and i will be going to fort worth, texas, to attend a nascar race, but more importantly, cook at a tailgate party with mario and rachael. i was all giggly, but it sounded like rachael said she couldn't wait to taste it, tho i don't recall her dropping a "yum-o" or anything. maybe she was reserving that for actually tasting it. anyway, thanks SO MUCH to everyone who got me through the quarters. couldn't have done it without you. i'm going to go douse my head in cold water now. so, for reasons i will not expound on, i have managed to convince myself that there is no way i lost this thing. and those feelings are only quelled by the absolute positiveness i have that there is no way i won this thing. the winner will be announced on the rachael ray show on friday. here in the tampa bay area, it is on ch. 8 at 2 p.m. i know in orlando and washington dc it is on at 10 a.m., and luckily i know people in both of those markets who will keep me appraised, so one way or another, we'll eventually know. i was really keeping it together until about yesterday, when my psyche began to crumble. i'm having trouble know that my fate as it relates to this has already been decided, and i don't know what it is. anyway, if you are interested in watching, friday is the day. wish me luck. the semifinalists have been announced now, and i am one of them! and in my lifetime, i haven't used as many exclamation points as i have in the past month! this is crazy. so, i am in the final three, and the other two are the pigeon guy and the father-son bbq team. there is no voting in this round (!!!!! ); a team that includes mario will pick a winner from among us. my only goal was to get to the round where we would be judged on merits. i wasn't excited about the voting round, but thanks to everyone who helped get me through it. the winner will be announced on the rachael ray show on monday, oct. 20. i am sure you guys all have your DVRs set to permanently record her show, so none of you will miss it. thanks again to everyone who helped me campaign. sean, laura, janet, anne and kelly all got me great play on the times web site. ellen and dan got me great play in tbt. kristin s. and phil included me in personal blogs (i know of those. if i didn't know of yours, thanks! ), 90-some people joined my facebook group and i know that many of you mass e-mailed your address books. pam went crazy in internet chats to drum up support. and all the gmail and facebook status update calls to vote made me feel really good. with all the issues that surrounded the voting, i really appreciate all the help. i will try to post the video soon, if you missed it earlier. we are now in the waiting phase of mario batali's ultimate grilling challenge. i should know by thursday whether i have advanced to the semifinals. i am very happy with my campaign, and the results that i am aware of so far. i have no idea what happened over the weekend when they went to the e-mail voting. i felt that that change may have helped me a lot, but it also seemed like a recipe for evil manipulation. and i am fairly appalled by a tactic i witnessed from one of my competitors. i just hope it didn't work for them. but, realistically, i realize that they were probably not the only one using sleazy, unsportsmanlike tactics. they were just the one i found. if i lost because i didn't sink to that level, technically, i guess, i have to be ok with that. i don't like to talk smack, but on a culinary level, i think my dish was the best of the seven. on a creativity level, ditto. i was a little rough in the video, but thanks to some awesome editing by pam, it was better than i might've imagined that i was capable of. and it was almost fun enough that i am planning my next video. more details on that as they come available. don't worry. no attack sites, no voting. and, come one, i definitely had the best dish title. like it was close. thanks to everyone who voted. i will try to not put either of us through anything like that again anytime soon.